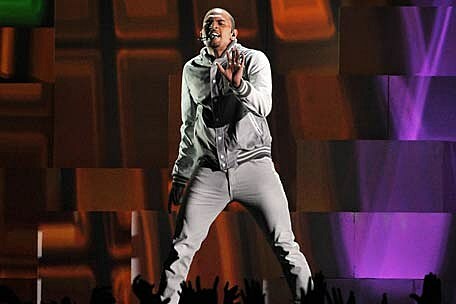 Chris Brown showed off his stellar dance moves during his performance at the 54th Annual Grammy Awards Sunday night (Feb. 12). The set marked his first time back at the prestigious ceremony since 2009. Dressed in a white varsity jacket and all-white everything else, the 'F.A.M.E.' creator did some fancy footwork as he climbed up a stack of lighted cubes to his new dance-centric single, 'Turn Up the Music,' which will appear on his forthcoming album, 'Fortune.' Two dancers supported him as he grooved to the beat and delivered lyrics like "Turn up the music, can I hear it 'til the speakers blow/ Turn up the music, fill your cup and drink it down." The 22-year-old R&B singer didn't do any aerial acrobatics from the ceiling like his 2011 MTV Video Music Awards set but he did remind critics he had a well-deserved place at the awards show. His choreography was intricate but not over-the-top. He also performed his 2011 Benny Benassi-assisted smash 'Beautiful People.' 'Fortune' is set for release later this year.